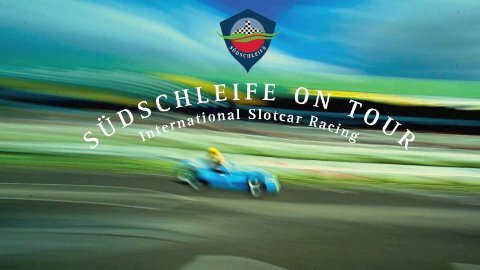 The tallest portable, six-lane profi-slotcar-circuit in Europe. 3715 fascinating, challenging centimeter with a long straight line ending in a tall 180° curve followed by two hairneedles presenting a shicane, climbing up to a bridge jumping in tall 360° curve before a tight 180° curve leads back to the finish line. Nearly equal curves ensure authentic sprint- and endurance races at its best. completed with timekeeping and projection of standings and results. Racing for max. 6 persons/groups at the same time. construction sector: min. 8 x 12 meters. Three-lane PROFI-RACE-TRACK with risk for addiction. 2816 challenging centimeter garanty spectacular slipstream-duels to fight for the right moment to take the lead. With along straight and back straights, tall and tight curves or hair needles, chicanes or even a banked turn. Completed with timekeeping and projection of standings and result. Racing for max. 8 persons/groups at the same time. construction sector: min. 4,5 x 8,5 Meter.